First Impressions Printing, Inc. has been providing full service manufacturing of custom wholesale envelopes to trade printers since 1989. Our specialized presses are designed specifically for use in printing custom envelopes. With production capabilities on each machine of up to 60,000 envelopes per hour, our pressroom can print wholesale envelopes in a quicker time frame than can be expected from traditional presses. Due to the specialized design of our envelope presses, we can also ensure greater consistency and quality for our finished products. 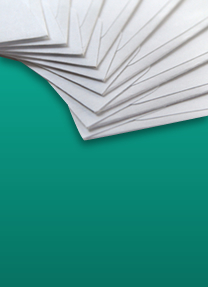 Wholesale envelopes are available from First Impressions Printing in a wide range of sizes, styles, stock, and finishes. We take the time to get to know your company in order to provide the best possible option for meeting your needs. Whether you are looking for standard business reply envelopes or are looking for a custom direct mail envelope, we can accommodate your specifications. The latest edition to our pressroom allows us to offer full color envelopes. With a UV attachment on this press we can print full coverage without the need to run flat and convert. Most of our wholesale envelopes are available in a variety of colors, weights, and finishes. Please ask about any specialized materials you may require. For a more detailed listing of wholesale envelope sizes and weights please view our envelope size guide. We have built a strong reputation throughout California for our full service wholesale envelope manufacturing. Our dedication to the quality and accuracy of our products as well as our focus on customer service has made First Impressions Printing a trusted supplier to the print trade. Call today to get started with your wholesale envelope order!